The FBI doesnâ€™t usually consult with music therapists to solve their cases. But Kendra Michaelâ€™s astonishing powers of observation and analysis have made her a favorite of law enforcement agencies all across the country. Blind for the first twenty years of her life, she cares little for investigative work but canâ€™t deny her unique skill, or the results sheâ€™s been able to facilitate. Kendra learned at an early age to become hyper-aware of her surroundings, perfecting the art of picking up the most subtle audio, olfactory, and tactile cues in the world around her. Like a secret weapon, she is in high demand. Former FBI agent Adam Lynch, known as The Puppetmaster, has weapons of his own. Heâ€™s a notorious master manipulator, skillfully handling criminals and colleagues alike to get the results he wants. Now he needs Kendraâ€™s special brand of help, but sheâ€™s not interested until Lynch reveals that AgentÂ Jeff Stedlerâ€”Kendraâ€™s exâ€”is missing and may have run directly into the path of a serial killer. What began as a heinous murder investigation escalates into something even larger and more frightening: a multi-million dollar conspiracy to hide a secret thatâ€™s worth killing for, again and again and again. Two years ago, Pulitzer Prize winner Chris Hedges and award-winning cartoonist and journalist Joe Sacco set out to take a look at the sacrifice zones, those areas in America that have been offered up for exploitation in the name of profit, progress, and technological advancement. They wanted to show in words and drawings what life looks like in places where the marketplace rules without constraints, where human beings and the natural world are used and then discarded to maximize profit.Â Days of Destruction, Days of RevoltÂ is the searing account of their travels. The book starts in the western plains, where Native Americans were sacrificed in the giddy race for land and empire. It moves to the old manufacturing centers and coal fields that fueled the industrial revolution, but now lie depleted and in decay. It follows the steady downward spiral of American labor into the nation’s produce fields and ends in Zuccotti Park where a new generation revolts against a corporate state that has handed to the young an economic, political, cultural and environmental catastrophe. Marian Caldwell is a thirty-six year old television producer, living her dream in New York City. With a fulfilling career and satisfying relationship, she has convinced everyone, including herself, that her life is just as she wants it to be. But one night, Marian answers a knock on the door . . . only to find Kirby Rose, an eighteen-year-old girl with a key to a past that Marian thought she had sealed off forever. From the moment Kirby appears on her doorstep, Marianâ€™s perfectly constructed worldâ€”and her very identityâ€”will be shaken to its core, resurrecting ghosts and memories of a passionate young love affair that threaten everything that has come to define her. For the precocious and determined Kirby, the encounter will spur a process of discovery that ushers her across the threshold of adulthood, forcing her to re-evaluate her family and future in a wise and bittersweet light. 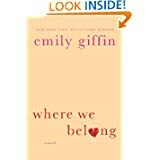 As the two women embark on a journey to find the one thing missing in their lives, each will come to recognize that where we belong is often where we least expect to find ourselvesâ€”a place that we may have willed ourselves to forget, but that the heart remembers forever.